1. How do we define race and what does it mean to be “black” or “white”? 2. What does it mean to be bi-racial (in Larsen’s era, the term was “mulatto”) and how does this affect how people think of themselves? 3. Is race just about appearance? 4. Do we have a duty to protect people from our identity group (race, gender, nationality, sexuality, etc) even if they aren’t a positive member of the community? 5. Is it okay to “pass” for someone we are not? What if you are passing to avoid harm? Is that excusable? 6. To what degree do we get to define our own identities and to what degree are we at the mercy of other people’s definitions? The details of Nella Larsen’s life, which she herself obscured in biographical statements, have been painstakingly reconstructed by her biographer, Thadious M. Davis. She was born in Chicago in 1891 to a Danish mother, Mary Hanson Walker, and an African-American father, Peter Walker. Her parents separated shortly after her birth and her mother married the white Peter Larson, from whom Nella took her surname. (Davis speculates that Walker and Larson might, in fact, be the same person–a possibility that does much to explain the secrecy with which she guarded her history. ) Larsen grew up in Chicago and attended the public schools there before Peter Larson enrolled her in Fisk University’s Normal School in 1907, an event that marked her permanent alienation from her birth family. Between 1912 and 1915, Larsen trained as a nurse in New York and, upon her graduation, went down to Tuskegee Institute in Alabama to work as head nurse at John Andrew Memorial Hospital and Nurse Training School. By 1916, however, Larsen returned to New York and took a nursing post there. Here she met Elmer Imes, a physicist, whom she married in 1919, and began her acquaintances with people influential in the burgeoning Harlem arts movement–what would later be known as the Harlem Renaissance. It was in this environment that Nella Larsen Imes’ interest in literature began to blossom. Her first publications were two articles about Danish games, published in the Brownies’ Book, a children’s magazine edited by Jessie Redmon Fauset. In 1921 Larsen left her nursing position and took a job at the New York Public Library’s 135th Street branch in Harlem and attended library school at Columbia University. She continued at the NYPL until 1926 and worked at honing her writing skills, writing several pieces of short fiction which she published, some under the pseudonym Allen Semi (her married name reversed). She was also at work on her first novel, Quicksand, which would be published in 1928 to some critical acclaim. Shortly after the publication of Larsen’s second and last novel, she published the story “Sanctuary” which concerns a man who, after shooting someone, seeks refuge in the home of a friend’s mother, not realizing that it is the friend who he has shot and killed. The power of this story paled when it was revealed that it bore too striking a resemblance to another story to be passed off as coincidence. In 1930, Larsen won a Guggenheim Fellowship (the first African-American woman to receive this award) and traveled to Europe to work on her next novel, which was subsequently rejected by Knopf Publishers. In 1933 she divorced Imes, who had been carrying on an affair for some time, and by 1934 she had retreated into obscurity. In fact, Larsen would live another thirty years as Nella Larsen Imes, a nurse living and working in Brooklyn, with no contact with her Harlem friends. Though there is evidence that she worked on up to two other novels, she would not publish another word. After controversy over whether or not she plagiarized portions of her 1930 story “Sanctuary”, Larsen stopped writing completely and lived the rest of her life as a nurse, dying in obscurity in 1965. For decades, her novels were ignored and forgotten until literary scholars began to discover her in the late 80s and early 90s. For researchers interested in race, sexuality, and class identity in the early 20th century, Larsen’s novels filled a void by voicing the experience of mixed race people. Larsen’s work has now become more popular than ever and she is taught in many high schools and universities. What exactly is “Passing”? Simply put, it was the process of light-skinned African-American people or mixed race people “passing” themselves off as white. 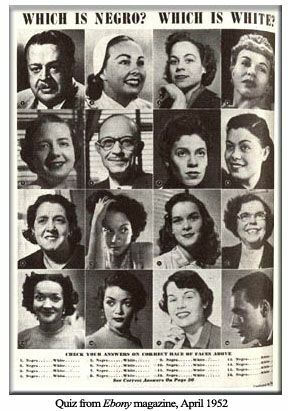 These light-skinned African-Americans decided to escape the racism that they faced in the early part of the 20th century by pretending to be white and living among white society. This was a hotly controversial practice because not only did it means having to abandon one’s family, but it also meant abandoning the African-American community and those too dark to “pass”. Many alleged that those who passed were ashamed of their race, and instead of fighting for their rights as African-Americans, they side with and aid their oppressor. Irene could only shrug her shoulders. Her reason partly agreed, her instinct wholly rebelled. And she could not say why. And though conscious that if she didn’t hurry away, she was going to be late to dinner, she still lingered. It was as if the woman sitting on the other side of the table, a girl that she had known, who had done this rather dangerous and, to Irene Redfield, abhorrent thing successfully and had announced herself well satisfied, had for her a fascination, strange and compelling. Clare Kendry was still leaning back in the tall chair, her sloping shoulders against the carved top. She sat with an air of indifferent assurance, as if arranged for, desired. About her clung that dim suggestion of polite insolence with which a few women are born and which some acquire with the coming of riches or importance. 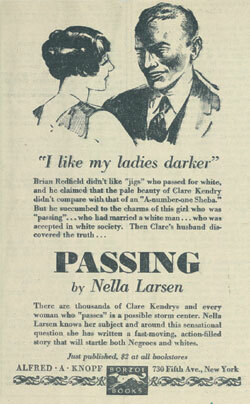 Clare, it gave Irene a little prick of satisfaction to recall, hadn’t got that by passing herself off as white. She herself had always had it. Just as she’d always had that pale gold hair, which, unsheared still, was drawn loosely back from a broad brow, partly hidden by the small close hat. Her lips, painted a brilliant geranium-red, were sweet and sensitive and a little obstinate. A tempting mouth. The face across the forehead and cheeks was a trifle too wide, but the ivory skin had a peculiar soft lustre. And the eyes were magnificent! dark, sometimes absolutely black, always luminous, and set in long, black lashes. Arresting eyes, slow and mesmeric, and with, for all their warmth, something withdrawn and secret abouthem. As you read over this passage, consider whether or not you think Claire is justified in her passing. What is Irene’s response and why? Irene’s curiosity about Clare is ultimately what drives the rest of the novel. Even though she is somewhat repulsed by Clare, Irene nonetheless becomes more and more obsessed with her as she worms her way back into Irene’s life. cheeks. Her sides ached. Her throat hurt. She laughed on and on and on, long after the others had subsided. Until, catching sight of Clare’s face, the need for a more quiet enjoyment of this priceless joke, and for caution, struck her. At once she stopped. Here, we learn that John Bellew is a virulent racist. Although he doesn’t realize it, his cruel joking has uncovered the truth about his wife. It would be one thing if Clare were lying about her race to a reasonable man, but to be pulling this charade with a racist ups the possible consequences. The fact that Clare wants to renew acquaintances with her old African American friends (at least those like Irene who can pass) sets the scene for the drama that will unfold in the next two parts. Paul Laurence Dunbar (1872-1906) is widely to be considered the first famous African American poet. The late 19th century marked the beginning of what was called the “Great Migration” in which the children and grandchildren of freed slaves began to move to the cities (often of the north) and work in industry instead of agriculture. Their sudden arrival was often met with violent backlash, and thus there was a renewal of racial tensions in this era. Think about the idea of race when you read this poem. What is the mask an extended metaphor for? Think about the general purpose of masks. When do we use them and why? Once you have thought about this, list all of the ways he describes the mask and what it covers. Does this explain why “we” wear the mask? Even though this poem is often considered to be about race, Dunbar purposefully wrote it in an ambiguous way so that it could apply to other subjects. Think about other reasons why “we wear the mask” and other situations this poem could be applied to. When do you “wear the mask” in your own life? Just like Dylan Thomas’s villanelle, a rondeau is deceptively simple looking. A writer must come up with a list of rhyming words (or in Dunbar’s case, a slant rhyme with the word “subtleties) that do not sound forced, and a powerful repeated refrain, here, “We Wear the Mask”. List out all of the rhyming terms and consider what they all have in common. How do the commonalities in these rhymed words help to drive Dunbar’s point across? Furthermore, think about how this “mask” can be applied to the characters of Clare and Irene in the story. How might “passing” be a type of mask that they wear? What are they trying to conceal and why? What kind of a mask do they choose and for which reasons?